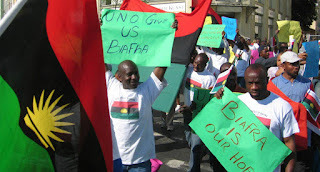 The Indigenous People of Biafra, IPOB, has insisted residents of Anambra must boycott Saturday’s governorship election because “Aso Rock decides who gets appointed into political offices.”. Describing elections conducted by the Independent National Electoral Commission, INEC, as “fraudulent,” the pro-Biafra group emphasised the need for the South East to ignore polls until Federal Government fixes a date for referendum. According to the statement, IPOB said it would allow voting across the South East when a referendum is called. The statement reads, “The worldwide family of the Indigenous People of Biafra (IPOB) and it’s leadership, under the supreme command of Mazi Nnamdi Kanu consider it imperative to reinstate the reasons why Biafrans have decided to lock down Anambra State on the 18th of November 2017 and never to participate in any fraudulent elections organised by INEC until a date for referendum on Biafra is set. IPOB family worldwide under the command and leadership of Mazi Nnamdi Kanu wish to remind the General public that we are not disrupting any election instead directing every Biafran living in Anambra State to boycott the election on Saturday 18 November 2017. “It is patently clear to all that since the return to what can best be described as the Arewa dominated militocracy in 1999, we Biafrans have been voting with nothing to show for it till date. In fact, the whole electoral exercise in Nigeria is as fraudulent as Nigeria itself. Nigerian government through the instrumentallity of INEC and security operatives especially the Nigerian Army and Police are doing everything possible to undermine the people’s wish in Anambra State election. “People can campaign and electioneer all they like, Aso Rock decides who gets appointed into political office. Our votes don’t count and will never count. Those participating in elections in Nigeria under the crazy militaristic Northern constitution drawn up by a Northern Islamic military head of state Abdulsalami Abubakar for the benefit of the Muslim North are either ignorant of what democracy entails or they are guilty of engaging in willful hypocrisy. “Nigeria runs a very corrupt quasi military feudalism modeled on the subservient ethos of the Hausa Fulani traditional emirate system of governance. That we call rulers of states in Nigeria governors or the fact they belong to political parties with stipulated tenure in office doesn’t remove the fact that they are in effect glorified Emirs answering to the new Sultanate Aso Rock instead of Sokoto. What obtains in Nigeria is not democracy, electioneering or voting, what we have is a carefully choreographed display of primitively nauseating politics of the jungle. “No reasonable person can point to a singular benefit of the much trumpeted dividend of democracy till date. Even the emergence of Buhari at the ballot box was characterised by such brazen rigging by 4 year olds in the North that Western election observers were repulsed to the point of concluding that it would be better and less shameful for their not to mention what happened in Arewa North. This is the same electoral climate you expect IPOB, the children of light, to participate in. “IPOB cannot participate in an electoral process where Aso Rock, through INEC, simply compile their own figures and declare whoever they like as the winner. Such political banditry will end in Nigeria tomorrow. It is therefore in the interest of democracy, good governance and accountability that all right thinking and courageous people must join IPOB to cleanse the political landscape by boycotting elections in Anambra State come tomorrow. “We pray other ethnic groups in Nigeria wake up to realise what IPOB is doing by demonstrating that power does indeed reside with the people, it will trigger a constitutional crisis that will lead to a renegotiated and people oriented governing constitution for Nigeria. This is simple common sense. Waiting for the same corrupt, lazy, oil dependent, repressive government of mediocrity to change their ways by voting for them every four years, is nothing short of foolishness of the highest order. The more you vote, the more they take you for granted. Enough is enough, let the revolution to free the enslaved masses begin this Saturday.